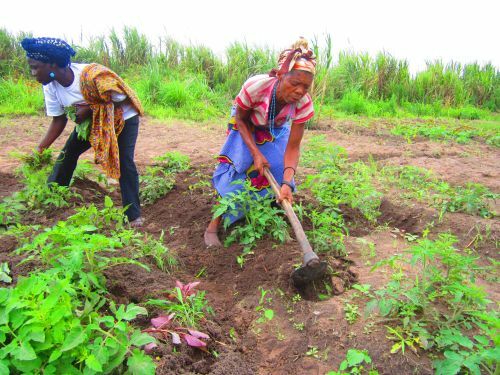 CAPANDA, Angola, Dec 28 2012 (IPS) - “We never used to eat carrots, but now we like them,” said Rebeca Soba, admiring her vegetable garden, an island of diversity in the midst of a vast sugarcane plantation. Vegetable gardening has been introduced at the Capanda Agroindustrial Pole (PAC) as a source of income for local small farmers. The vegetable gardens are part of a social programme, Kulonga pala Kukula (“education for development” in Kimbundu, the local African language), which also includes actions to promote health, water availability and education. Women and a few men plant a variety of seeds brought from Brazil in 10 villages close to the Capanda hydroelectric plant, 360 kilometres from Luanda. Some species were unknown to the local population, like parsley and arugula, which they cook rather than eat in salads. “It’s very bitter,” said Soba, a 45-year-old mother of five, who is one of the leaders of the agriculture programme for small farmers. She and her group grow cabbage, peppers, tomatoes, kale and other vegetables on low-lying land that is too wet to be suitable for sugarcane. Fifty-four percent of the families in the 10 villages involved were living in extreme poverty, with incomes of less than 34 cents of a dollar a day, according to a study carried out in 2009, said Kimputu Ngiaba, an agronomist with the programme who is responsible for production. Now some women are making over 500 dollars a month when there is a good harvest, according to his records. They have also changed their eating habits, resulting in better nutrition. A decisive factor is guaranteed sales. The Nosso Super supermarket chain, which has 29 outlets around the country and is controlled by Odebrecht, the same Brazilian group that runs Kulonga pala Kukula, buys a large proportion of the produce. Other purchasers include the canteens that feed thousands of workers on the other PAC projects, such as the Companhia de Bioenergia de Angola (BIOCOM), a biofuel concern which currently employs some 800 people planting sugarcane and building industrial plants for the production of sugar, ethanol and electricity, beginning in 2013 if all goes well. Initially there was little enthusiasm for the project, because the 27-year civil war had broken down bonds of trust and undermined good working habits. But after the first payment from the sale of vegetables, “the number of participants doubled,” said Ngiaba. Now, 1,020 families are involved and selection mechanisms have been put in place, he said. Soba bought a gasoline-fuelled generator with the first payment she received – an item that is coveted by many rural and urban Angolans who want to be prepared for frequent power failures. And Rosa André, a mother of three, was able to buy medicine and get health care for her ailing husband, who helps her in the vegetable garden when he can. For many of the 38 families in the village of Luxilo, the money serves to support their children who are studying in Luanda. Of the seven children of Antonica José Agostina, a 63-year-old widow, three left for the capital. “Everyone goes to Luanda to study,” she said. Her husband died in the war, in 1999. “Angolans are keen to learn,” said Felismina Lageslau, in charge of promotion of the Kulonga programme. Last year there was no malaria in the villages, and this year there was only one case, she said, referring to the success of the preventive health actions. Wells providing drinking water in the larger villages, and rainwater harvesting in the smaller ones, contributed to reducing diarrhoea, and hence infant and child mortality, while training provided for traditional midwives reduced the perinatal mortality rate by 60 percent, said Lageslau, who is a social psychology student. The programme is also trying to improve the production chain for cassava, a traditional crop in the region, by increasing production and commercialisation of cassava flour, a staple food in Angola. Fruit production – pineapples, pawpaws, bananas and watermelons – is also being introduced in the vegetable gardens. Reviving family farming – which was a traditional way of life in colonial-era Angola, but took a nosedive after independence – will be a great legacy to the nation, said Felipe Cruz, head of investment in PAC, who is responsible for Odebrecht’s support for the agroindustrial sector. Kulonga is a pilot plan set to expand in a rural area that is home to 70,000 people, stimulating production, improving health and strengthening the sense of citizenship. This plan will demand “technical insistence”, as Cruz calls steady outside support to bring small farmers out of the subsistence culture and into the world of commercial marketing. This is the second of three lines of action to consolidate the PAC in a territory of 411,000 hectares which benefits from existing infrastructure: water and energy from the Kwanza river, roads, and a railway, Cruz said. The first line is to attract “anchor companies”, like BIOCOM and large plantations that grow and industrialise basic grains, producing oils, flours, animal feeds and other derivatives. The absence of production chains hinders agricultural development in Angola, he said. And the third, which is “more complex and longer-term,” is to form “a rural entrepreneurial class which is non-existent in Angola.” Small farmers, for example, will have to form their own self-managed cooperatives, he said. Odebrecht is in the lead in the effort to rebuild and modernise Angolan agriculture, as well as executing key projects in the field of energy and restructuring the Luanda metropolitan area. Four of the six seats on the board of the Society for the Development of the Capanda Agroindustrial Pole (SODEPAC) are occupied by Odebrecht. SODEPAC administers all the local initiatives, runs the Kulonga project, and manages BIOCOM in conjunction with its partners, the state oil firm Sonangol and the private Angolan firm Damer Indústria. BIOCOM plans to produce 260,000 tons of sugar, substituting for imports, and 30 million litres of anhydrous ethanol, which added to gasoline makes combustion engines less polluting, as well as generating 45 megawatts of electricity from sugarcane bagasse (the fibrous material remaining after crushing). Ethanol production in Angola “has not been proved to be viable, either economically or technically,” said Fernando Pacheco, an agronomist who is known to be critical of government plans and an activist in favour of family agriculture and cooperatives. The PAC in its entirety is “too ambitious for the institutional and human capacity of Angola,” and the different projects “are not coordinated or integrated,” he said. In his view, the priority in Angola is “to generate jobs for young people on a mass scale, but agribusiness does not do this, and it requires a great deal of scientific and technical knowledge, much of which has been lost since the 1970s,” Pacheco said. Up to 1973, Angola produced most of the food that it consumed, and exported coffee, maize and cotton. In contrast, its harvests are now meagre and food imports have soared, according to a report published this year by the Catholic University’s Centre for Scientific Studies and Research. This transformation was due to the war, “which destroyed production capacity and mobility,” but “also to political mistakes over many years,” such as a lack of investment in infrastructure, an overvalued local currency, and the rural exodus, the study says, while complaining about the lack of credible national agricultural statistics.